What’s claimed to be the first plane in the world to be made primarily from industrial hemp will also be powered by fuel derived from the same plant. Based on an existing design, the team behind Hemp Plane will replace materials such as fibreglass and carbon fibre usually used in small aircraft with industrial hemp based components. This includes the outer shell, wings, seats and some other interior components. Its creators say the end product will consist of at least 75% hemp. Hemp is similar to carbon fibre in that it is durable and lightweight; but has the added benefit of being sustainable. Apparently it’s also two to three times less expensive to fabricate than fiberglass. For an added green boost, the plane’s biodiesel engines will run on an industrial hemp based biofuel; which is being developed in Costa Rica. Hemp biodiesel is made from the oil of the hemp seed whereas hemp ethanol/methanol is made from the fermented stalk. A 2010 University of Connecticut study found high conversion efficiencies in producing hemp biodiesel – 97 percent of the hemp oil was converted. The fuel demonstrated properties suggesting it could be used at lower temperatures than any biodiesel available on the market at that time. The twin-engine, four-seater plane will have a cruising speed of over 320 kilometres per hour. The project has been in the works for a couple of years. The Hemp Plane creators had set a goal to finish the plane by next year; but it’s unclear if that goal will be realised after a Kickstarter crowdfunding campaign failed to raise enough funds. However, it appears the campaign will be re-kick-started again soon. There’s certainly been plenty of interest in the project. Apparently, the Discovery Channel’s Daily Planet will film the construction and launch. The plane will be constructed by Velocity, Inc. (Sebastian, Florida). Should the plane end up being fully completed, its maiden flight will occur at the birthplace of aviation – the Wright Brother’s Memorial located in Kitty Hawk, North Carolina – early next year. 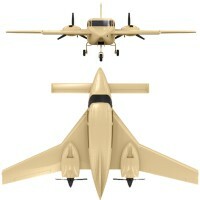 “The Hemp Plane project is an evolutionary advancement of society. It’s proof and acceptance will lead to a much-needed change in our day-to-day lives that is required for humanity to evolve,” says CEO and team leader, Derek Kesek. Next articleCannabidiol An Alternative To Anti-Psychotic Medication?